Shortly after the organization of the National Society of the Children of the American Revolution in 1895, the Mary Lamphere Society of the C.A.R. was organized in 1896 in Tacoma, Washington. It has since been disbanded, as have a number of other local societies even to the present time*. The oldest C.A.R. 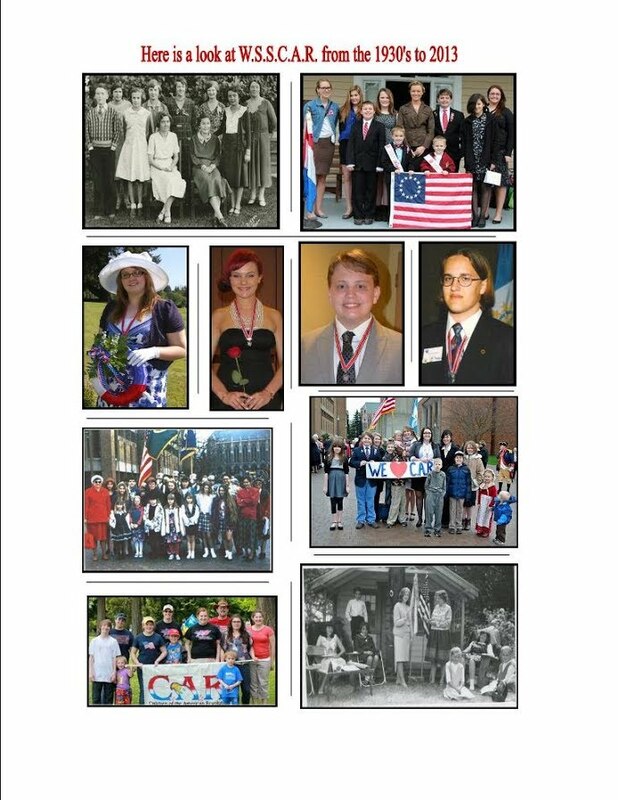 Society still in existence in the State of Washington is the Ada L. McCleary Society, organized in 1924. By 1934, it was the only local society remaining in the State. From 1944 to 1947, there was a renewed interest in the C.A.R. in Washington. In 1947, the Washington State Society was organized under the leadership of Mrs. Richard I. Sampson. The local societies are units of the National Society and the State Society is organized to include the local societies. A state society cannot exist without at least two local societies. Originally the officers of the C.A.R. were all members of the Daughters of the American Revolution, or DAR. In 1939 member officers were established and termed "junior officers". Thus there was a National President and Junior National President, and so forth. In 1958, the adult officers had the prefix "senior" added and the member officers had the "junior" prefix deleted, thus having a Senior National President and National President. The National Society made this change in 1958, but it took a while for Washington State to make the change. Members of the Sons of the American Revolution, or S.A.R., also serve as senior officers. In Washington State, the member State President was appointed by the Senior State President until 1968, when Dan Kraft became the first elected State President for the Washington State Society. *Societies in Washington State that have been disbanded include Thomas Pickering Society, Kitty Livingston Society, Liberty Flag Society, Elisha P. Ferry Society, George Washington Society, Henry Hudson Society, Alice Clarissa Whitman Society, Aberdeen Society, Cameahwait Society, Kamiakin Society, Trail Blazers Society, Fort Walla Walla Society, Teekalet Society, Skagit Chief Society, Baptiste Society, Kulshan Society, Colonel Henry Peyton Society, Captain Robert Gray Society, Sarah Livingston Society, Totem Pole Society, Johnny King Society, Hoquiam Society, Auburn Society, Port Angeles Society, Jacob Ebby Society, Juan de Fuca Society, Savannah Society, Henry Francisco Society and Fort Nisqually Society. Mrs. John A Peterson, Sr.